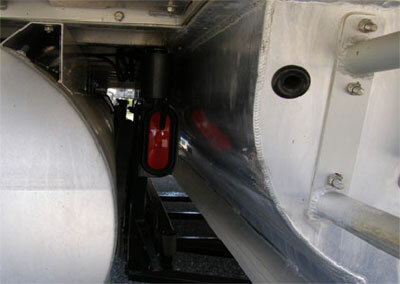 Our wide axle bunk trailer is perfect for most triple tube pontoons. 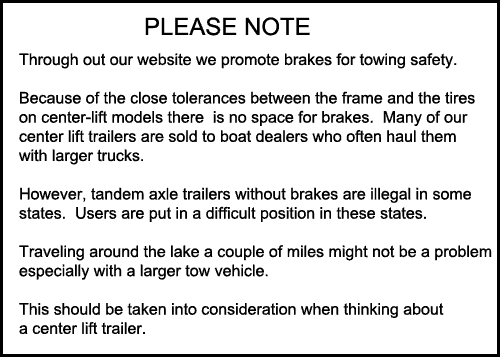 But if you're in shallow water or want to store somewhere with low clearance, the center lift tri-tube trailer is perfect. We’ve sold this trailer for nine years in a hydraulic version to marine dealers who move a lot of boats. 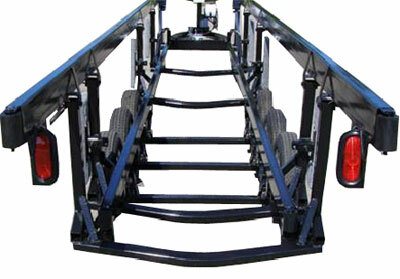 A hand crank version for light duty or retail use for the popular 21’-23’ triple tube pontoon boats that weigh under 4000 lb. It will fit most 8’6” wide triple tube pontoons and some older 8’ wide boats as long as you have 49” clearance between the outside pontoons. It will NOT FIT the Bennington Elliptical center tube (the one that’s shaped like an egg on its side).